Many individuals like to use an acronym to get started on an organizing project, and the post from last week offered some of our favorites. These steps can be used when organizing paper, belongings or time. Over the next few weeks we will be offering specific advice on each of these steps to help you reach your goal. Disorganization does not happen overnight, nor does the solution. By using the steps that we provide, you may not have this New Year's Resolution in 2014! Start Small every project should start out small and gain momentum! Overwhelmed and don't know where to start? Choosing the place to start is hard for some people - try imagining which area would give you the most peace to have cleared out, then start with a single spot. The place you begin might be a drawer, closet or pile of paper on the desk. Once cleared, move around the room, tackle another small area, and before you know it, mission accomplished! 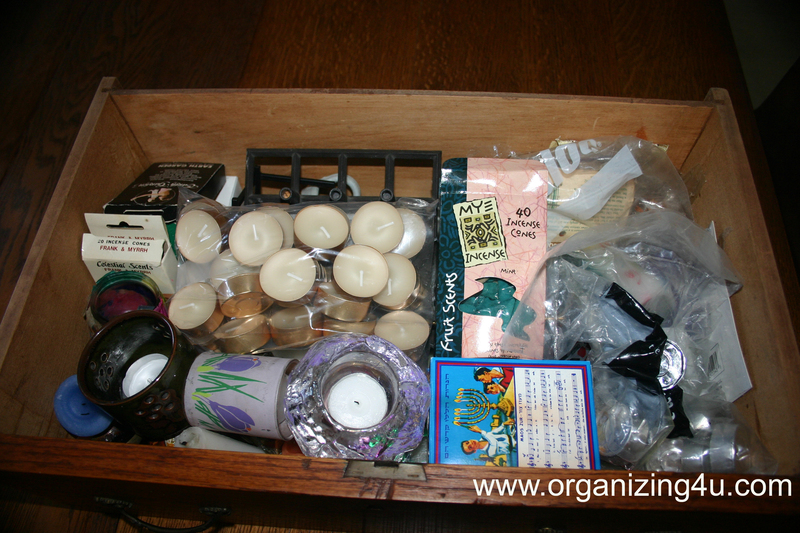 We are going to start with this small drawer that is used for storing candles. Doesn't really look that bad, but check back in the coming weeks to see how much is actually stored in the drawer, and how much easier it will be to find items once it is organized! Trouble staying on task? Try setting an egg timer for 15 or 30 minutes at a time. During that time you work on the project and don't leave the room! As you find items that belong in other areas of your home or office, put them in a box and deliver them after the timer goes off! Many people find it easier to work on organizing projects with someone who will re-enforce staying on task and can make the project more fun. If you have a friend or relative who is willing to help, give that a try. Or you could call your favorite Professional Organizer!